It’s easier to pardon the show interruptions when they’re this aspirational. Campaigns like this one are million-dollar efforts to reach cruisers (and non-cruisers alike) and extol the glory of not only cruising the world, but doing it The _____INSERT CRUISE LINE HERE ______ Way. 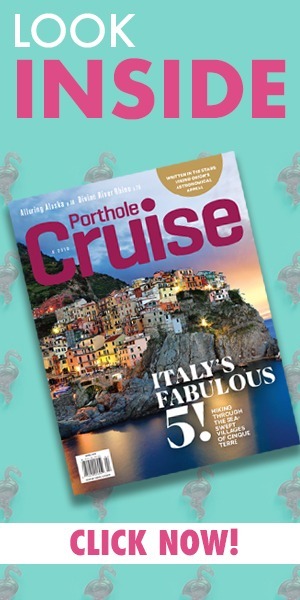 And while we at Porthole work tirelessly to help you see through the spin and enjoy the perfect cruise vacation for you, today we celebrate the Pitbull-esque efforts to make brand messages entertaining. As always, “Feel Free” to share yours in the comments below. Perhaps the most famous spokesperson of the seas, Kathie Lee joined forces with Carnival to sing about all-day fun and jealous landlocked friends in the mid-’80s. (Just last year, Kathie Lee announced that she’s going back on board with her own wine collection.) When Carnival isn’t spreading its messages with Today show hosts, they’ve used bears as well as the voice of The Office’s John Krasinski. One might argue that Princess — and the cruise industry in general — had the greatest commercial money could buy in the Aaron Spelling–produced series that started welcoming American audiences aboard in 1977. These enticements weren’t limited to prime-time Saturday night offerings, though. Princess touted its transcendent qualities — “It’s More Than a Cruise, It’s the Love Boat” — in commercials both with and without its beloved television cruise director. Who can say for sure that Iggy Pop wasn’t singing about snorkeling and glacier-hiking when he recorded this punk anthem with David Bowie back in 1977? That drum intro alone could fuel a cruise ship, let alone inspire cruisers to, as Royal Caribbean hoped with those commercials, choose adventure. Honorable mention here goes to Royal Caribbean’s adorable Shellphone. Literally using its company name and lightly using that harmless “I miss being spoiled” entitled feeling that so many of us cruisers develop upon coming home, Celebrity Cruises found humor while simultaneously championing its stellar service. Who hasn’t felt the spectrum of in-the-moment highs and afterglow glum? From its very first commercial, Disney Cruise Line has used both its natural and magical settings to perfectly capture the wonder a Disney cruise has in store. In our favorite ad, however, the elevator sales pitch hyping those wondrous offerings is much more literal and direct … that is, until the pitchman gives a nod back to nature and magic again in a truly unforgettable way. I dont think I’ve ever been aboard, the same Carnival Ship Cathy Lee was on. I’ve tried a couple of times. None of my Carnival Cruises looked that Elegant!